On the first weekend of December, 50 members of the London Local Team were chosen to sell their handmade goods at the very exciting Etsy Made Local Christmas market in Soho. The event was organised by Etsy UK in collaboration with the team and with over 5000 visitors over the weekend, the event was a massive success for everyone involved. After months of planning, curating and designing and hammering, Etsy turned the venue (the Vinyl Factory) into a beautiful house of craft. London Local team leader Shoshana, owner of Etsy shop ShoshyCadoodle, was called upon for her amazing eye for design and illustration and was chosen by Etsy to lead the organisation of the wrapping station. This was a free gift wrapping service for any purchase at the event. Lots of team members and family members volunteered their time to wrap gifts which created a beautiful communal spirit. After hours of training, our wrapping agents were up to speed on how to wrap any object with style. On the picture below, you can see Jane from Vknit and Melissa from MelissaReHandmade in action. The wrapping station was a great way for Etsy sellers to chat with customers in a more casual environment and to the sound of live music. And so many more that came to help out the team when we needed them the most: Saffie, Arati, Rachel, Deborah, Bindya. All the sellers at the event who agreed to left their stall for a few hours or send one of their relatives to help: Antje from Pasinga, Dee from Suede&Co, Rod from Rodology, Javier from ArbelogyStudio, Gunna from Gunnaydri, Nicole from VincentElvis, Jo from Joheckett, Rhiannon from RPalmerJewellery, Zoe from Ladybirdlikes, Ruth from iamacrylic, Leila from LeilaSwiftJewellery,Emma from wildfawnjewellery, Becky from PJmamma, Melodie from Slinkylinksjewellery, Harriet from HelloHarriet, Louise from SuperDuperThings, Laura from Laurabird, Zuzana from zlalikovatextiles and their friends, family members that came to help: Joanna, Jane, Gemma, Veronic, Andrei, Vicky, Jenny to name a few. Here are a few of the products that were available at the market. None of this would have been possible without you, supporters of handmade and ethically produced goods. Thank you for supporting small, independent businesses and buying local. 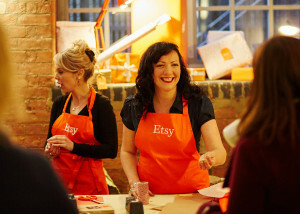 Finally we want to thank the Etsy UK team for putting together such a beautiful event! Keep an eye out for our next events, coming in the beginning of 2016. And to finish the year on a happy note, have a merry Christmas and a Happy new year! We respect your privacy, we don't spam.